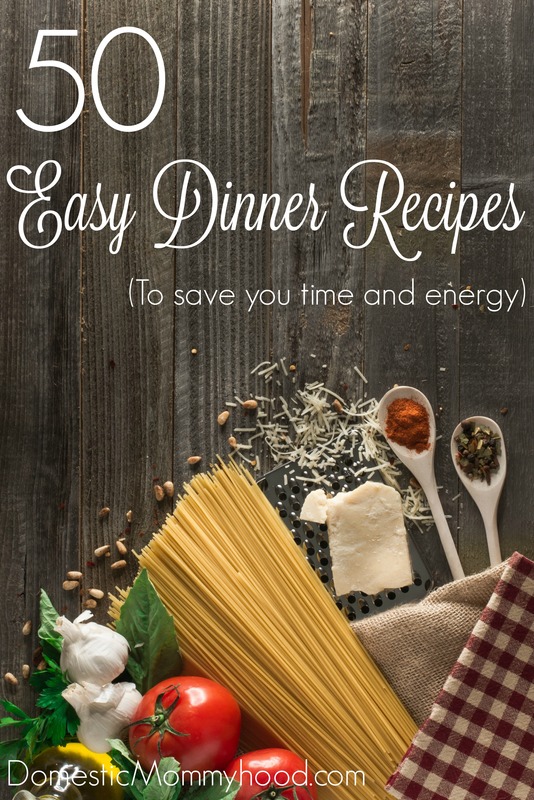 50 Easy Dinner Recipes to Save You Time and Energy! Are you looking for more Easy Dinner Recipes? You all know the drill of a nighttime routine with kids. It’s absolutely unexplainable….. I’m thinking survival of the fittest! Here is what happens at night when you have children. I know you guys know what I’m talking about. You walk in the door from work and school and the clock starts ticking….. tick-tock…. tick-tock! The race is on, you have a little bit of time to get 100 things done. Those kids must be in bed on time or tomorrow will be the worst day of your life. No matter how hard you plan, write lists, and enlist the help of your family you are doomed to fail as a parent. These are real problems that cannot be helped and you are stuck dealing with them. The ONLY thing you can change is to make an Easy Dinner Recipes for supper. We all want to be Supermom or Superdad but seriously people, it is just not possible! I am the master at finding easy recipes that can be put together in a flash and make it look like you really did something great! Below you will find 50 Easy Dinner Recipes to get you started. Print them, write them in your recipe book, pin them on Pinterest (follow me on Pinterest while you’re there), whatever you need to do to keep them handy and ready to go. I promise your week will go better than it has in a long while folks!! Every week I do a quick search online just for Easy Dinner Recipes so I can keep finding new ideas to try. That way my family doesn’t get bored with the same old things every week! I share a ton of recipes on Pinterest. You can find and follow me here. This Italian Stuffed Zucchini Boat recipe is perfect for anyone who has a garden. You all know who you are! How many gardeners out there that always look for a new way to use up their Zucchini! Having trouble deciding between pasta or pizza? This Pizza Penne Pasta is the best of both worlds and easy to do! I would love to hear all about your favorite Easy Dinner Recipes that you serve in your home!! Leave me a comment below with you idea so we can all give it a try! Here is a list of my favorite Easy Dinner Recipes Cookbooks…….